You’re probably one of the 76% of UK adults that own a smartphone. Like more than half of us, do you also reach to check your phone within 5 minutes of waking? I do. Before leaving for work I typically check the news, text messages, Facebook, Instagram and Twitter. Once on the bus to work I then check work emails and calendar appointments, mentally forming a plan of action for the day ahead. The smartphone climate in the UK has changed significantly over the past 5 years. We all see people around us engaged with their phones … on public transport, shopping, eating in restaurants, even while crossing the road. This adds up to a lot of smartphone time. According to the 2015 UK Mobile Consumer Survey people in the UK check their smartphones over one billion times a day. This culture change has seen smartphones become integrated within our everyday lives, providing opportunities to introduce many new services to our fingertips e.g. shopping, advertising, booking holidays. Importantly for our research unit, the opportunities lie in improving public health. Social networks: what role do they play? 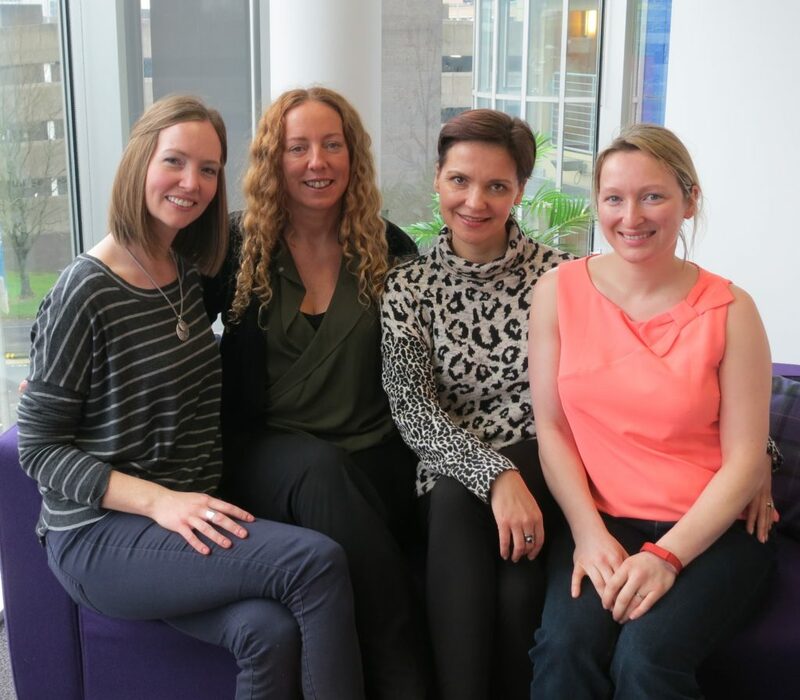 Our HelpMeDoIt team obtained funding from the National Institute for Health Research to develop and test out a weight loss app. There are many weight loss apps available already, however, we are interested in how an app can also harness the support of a person’s social network. We have all experienced how much easier it is to achieve a goal when we are supported by people around us. It is the same for weight loss. Research shows that people who have social support are more successful at losing weight and keeping it off long-term. 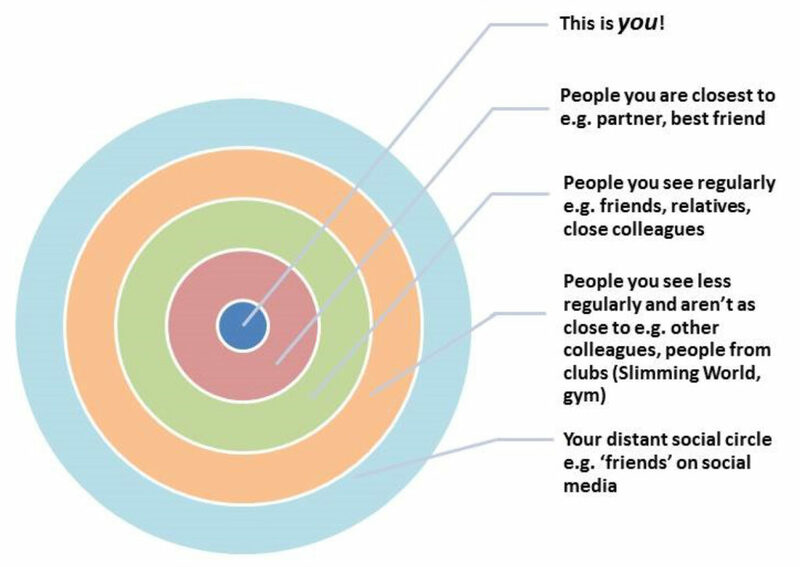 The term ‘social network’ does not only relate to online ‘friends’, such as through Facebook (which are often numerous distant acquaintances), but also a person’s closer social circle, such as their relatives, close friends and colleagues (illustrated below by HelpMeDoIt’s sociogram). In particular, harnessing the support of people that an individual is in touch with regularly can play an important role in their success with weight loss. An interesting fact that our team found out when developing the app was that 87% of people download and use a new app only once! On reflection, I have certainly downloaded and tried many apps and then deleted them within the week. This gave us food for thought in terms of how to make the app as engaging as possible. Luckily, we were collaborating with an experienced software development company who had many simple but helpful ideas, such as limiting text on the first screens that people see. We also used a panel of 10 lay-users to help us develop the app and they gave us a great insight into the do’s and don’ts of the app. Examples included a limit on the number of reminders sent each day, the preferred use of push notifications compared with text reminders, and daily motivating messages on each login. What are we interested in finding out? Did people use the app? How often and for how long did they use the app? Did people lose weight by using the app? Did they interact with their helper using the app? What were the experiences of people who used the app? So will our HelpMeDoIt app help people lose weight? We’ll be collecting lots of information about the study as it progresses over the next year. It’ll be really interesting to see if the app is used as intended, and exactly what role the social support element of the app plays. Watch this space … in the meantime you can also follow us on Facebook (helpmedoitstudy) and Twitter (@HelpmedoitStudy). This research was funded by a grant from the National Institute for Health Research. The MRC/CSO Social and Public Health Sciences Unit is funded by the Medical Research Council and the Scottish Government Chief Scientist Office. The views expressed are not necessarily those of the Medical Research Council or the Scottish Government.